To be honest I did not know much about this vehicle; I picked it up because it looked cool and I wanted to see how W models’ kits look like. This Lithuanian company specialises in Soviet era missile launchers, radars and other unique-looking vehicles in 1/72. I’ve known about these models for a long time; even when I was still living in the US I had my eyes on them. Back then I had very little disposable income, and the pricing took these models out of my reach; things have improved (somewhat) since then, so I took the plunge, and got one to see how they measure up as models. 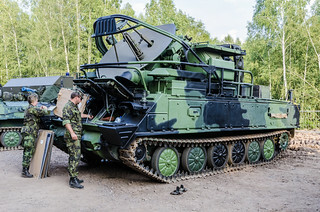 The 1S91 vehicle is a part of the 2K12/SA-6 Soviet mobile surface-to-air missile system to provide medium to low level defence for ground forces. The system itself typically consists of four missile launchers carrying three missiles each, four missile transports, and the 1S91 SURN vehicle. Interestingly there are several 1/35 and 1/72 options available for the missile launcher platform, but the mobile radar has not received much love from model makers, even though if I may say so, it does look wicked. The 1S91 (SURN, NATO designation “Straight Flush”) mobile radar is based on the GM-568 tracked chassis developed by MMZ (Mytishchinskiy Mashinostroitelniy Zavod). It is a 25 kW G/H band radar with a range of 75 km, equipped with a continuous wave illuminator, in addition to an optical sight. The vehicle has two radar stations – a target acquisition and distribution radar (1S11; the lower radar station) and a continuous wave illuminator radar (1S31; the upper radar system), in addition to an IFF interrogator and an optical channel. The two radars can turn independently. The model comes in a typical cardboard box with the boxart printed on top. The parts are placed into zip-lock bags, and cushioned with newspaper. The system seems to work; even though the model has several large and delicate parts, nothing was broken. Some parts were detached from their pouring blocks, though. The quality of resin is excellent, no bubbles, flash or imperfections. The radar dishes are thin, and very nicely done. On the back of some larger, flat parts you can see the ribbing left over from the 3D printing process, but none of it is present on the visible surfaces. The PE sheet is really well done; it’s just the right thickness. This is an important point, since the PE has structural functions in this model. I built kits that had PE so thick it was really difficult to cut even with pliers, and other sets had PE that was so thin it crumpled when you touched it. All in all, the detail is really good; W Models seems to have a very high standard of production. The assembly is relatively straightforward. The first steps detail the assembly of the hull. The lower hull needs to be assembled from flat parts. The fit is overall OK, but there were gaps between certain panels; this is why I prefer the “tub” style resin hulls. In this case I needed to use filler to fill these gaps. To make sure the attachment points of the hull sections are as sturdy as possible once the CA glue set I used some green stuff on the joints from within. It also served as filler for the larger gap on the back of the hull. The holes for the swing arms for the road wheels need to be enlarged so that the locating pins fit; it’s also a bit unfortunate that there’s nothing to help setting the arms at the correct angle. The tracks are the typical straight resin pieces. You need to put them in warm (~50C) water to soften them, and then gently wrap them around the drive wheels/idlers, and form the appropriate sag where necessary. The drive wheels have very well defined teeth, but the fit to the tracks is a bit problematic; the drive wheels were a tiny bit wider than the distance between the corresponding parallel holes on the track. It’s possible with a very careful application of force to push the teeth into the holes in the track, but one has to be cautious not to break them off. The travel configuration of the vehicle is pretty interesting, too; it’s a shame it’s not an option with the kit. Once the radar assembly is complete, some further details are added to the hull, such as the already mentioned guards, and we’re done. (The guard system seems to be consisting of two independent curved rails; one fixed, and one movable. They should be touching in the folded position (when the radars are erected and are in use); yet part 34 is shorter, and does not reach the others. Since it’s literally just a curved piece of resin rod, it should be easy to fashion a longer replacement piece. I kept this parts for the purpose of this review. The model is actually quite complex, but not immeasurably so. It can be built with a reasonable amount of experience; even the PE handles well. Vehicles like this do not get banged around as much as tanks and other armored fighting vehicles, and if they do get to the wrong end of the enemy’s guns, they usually end up a mangled, smoking wreck, so excessive chipping and other weathering was not really an option. They also tend to avoid heavy mud, and are kept in pristine condition by their crew. Since I wanted to depict a non-derelict vehicle, I kept the model reasonably clean. I decided to put everything together before painting; that meant the tracks as well. I kept the radar installation detached for ease of handling but everything else was fixed. I washed the model in warm, soapy water, and let it dry for a couple of days. The model received a German Grey primer coat (Vallejo) to provide a good, stable base for the subsequent paint coats, and also to pre-shade the model. There is an argument for not using primer: modern paints adhere to almost any surface. With resin I found that it’s still a good idea to prime first. The lower part of the hull was treated somewhat differently. The roadwheels got a small spray of green each, and I went over the rubber rims with dark grey using a very fine brush. I also corrected the oversrpay on the tracks using the primer. The color was pretty good for the tracks; I used some rust wash to give them some variance, and a silver pencil to simulate the worn down, shiny parts. I diluted earth colored pigments in white spirit, and after leaving the mixture on the roadwheels, and the bottom of the hull for half an hour, I wiped the excess away with a damp brush. I repeated this step with a couple of earth colors going from lighter to dark. True Earth has a couple of filters in their product lines; I bought them a while ago, but had no luck with them so far. (I did work out you needed a very flat surface to apply it; the surface tension tends to pull the filter into droplets.) I sprayed some dark aging and light aging filters on some selected areas without diluting the product: around the turret, on the lower part of the turret, on the bottom of the tank; the effect is not as smooth as I wished it to be, but it does produce an interesting discoloration here and there. I used some yellow, light brown and yellow filters on the model in several coats; the lighter ones were focused on the top parts, the darker on the bottom. As further filter I used Tamiya’s transparent yellow sprayed from above; it provides an interesting brighter highlight. Once the model dried, I gave it a coat of semi-gloss varnish, and applied pin washes to make the details stand out. (I usually don’t use black; dark brown is a good color for a wash.) This was a good time to add some discreet streaks using oil paints as well. I printed out some Hungarian signs a while ago on decal paper; I’ve used these to give the vehicle some sort of identity. A matte varnish was used to seal everything, and give the final sheen of the model, and I applied a couple of layers of dust using Tamiya’s weathering sets (the makeup-sets), and different dust colored pigments straight. I used the pigments dry, and rubbed them on using a rubber brush -something I saw on Armorama. Since I only wanted a moderately dusty vehicle whatever is left on it would be sufficient. That’s pretty much it. I have to say the model is quite impressive, both in quality and in appearance. If you don’t mind the scale and the price, it is highly recommended. I would like to hear your thoughts- please let me know what you think in the comment section. Great work. Far too delicate for my fat fingers. I will try using more filters on my bigger models though. To be honest it wasn’t like microsurgery. Most 1/72 models don’t have smaller parts than the high-tech 1/35 ones. What do you mean by the filters? The thin wash glaze things that you used to modulate the base colour.